The week’s headlines have been heating up with talk of war, so for this week’s trivia question, we thought we’d head up north to cool off. Rob Ford, that upstanding fellow, withdrew his bid for re-election as mayor of Toronto last week, citing health issues. Almost immediately, his brother Doug declared he would run for mayor. This week’s question is: In this country, who was the last member of Congress who was succeeded by his or her brother? Submit your answer in the box below. We’ll pick a winner at random from the bunch. The winner will get a fabulous, vintage Political Junkie button. Don’t forget, you can get the trivia question a whole day early by simply liking our Political Junkie page on Facebook every Wednesday. You can sign up for our Political Junkie newsletter, too. You’ll get all the latest from Team PJ every weekend right in your inbox. Last week’s trivia question was all about the ladies (just like this week’s show): What’s the first state to have a woman as its governor as well as one of its senators at the same time? The answer is Kansas. 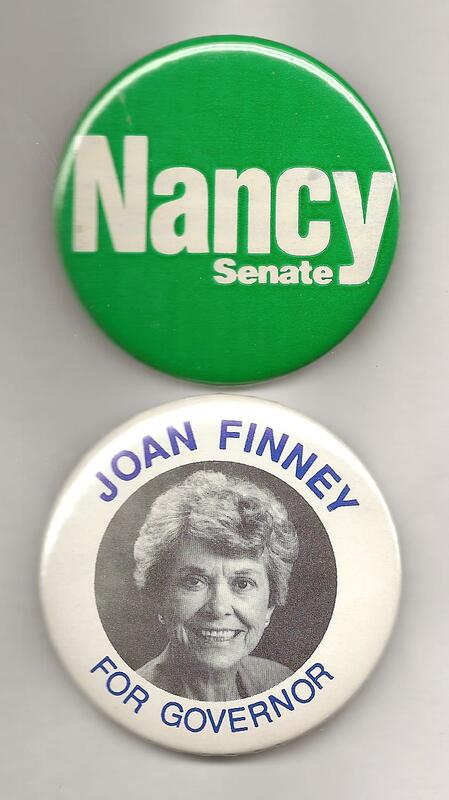 In 1990, while Republican Nancy Kassebaum was winning a third term in the Senate, Joan Finney, a Democrat, was elected governor. And the winner is… Kristene Yaw of Shaker Heights, Ohio. Kristene gets the coveted Political Junkie button!